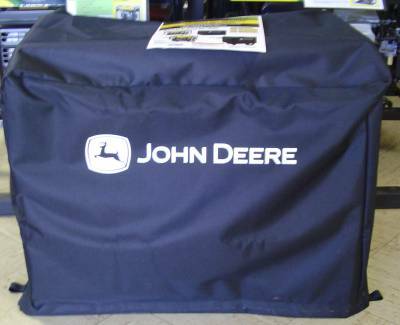 John Deere Generator Cover. 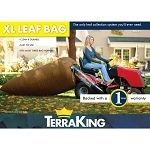 This cover is made from water resistant 600-denier, vinyl backed polyester. It has velcro straps to secure the cover and is easy to clean with soap and water. 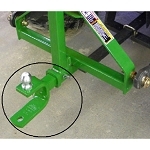 This cover is compatible with both standard generators and generators with wheel kits. 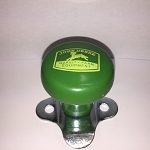 Fits the AC-G4000S, AC-G4000H and AC-G5000S Generators. Medium cover measures 28" Long By 21" wide By 21" Tall. 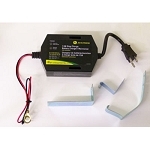 Fits the AC-G6000S,AC-G6000H,AC-G7500H and AC-G8000S Generators. Large cover measures 32" long by 23" wide by 22" tall. Wait until engine cools down before placing cover over the generator. Do not operate the generator with the cover in place. Make sure straps are secure before driving with the generator in an open vehicle. I was very pleased with this John Deere Heavy Duty Generator Cover. It will last and the material it's made of will keep my generator dry and dust free. I would highly recommend it for anyone looking for something that will protect your generator.